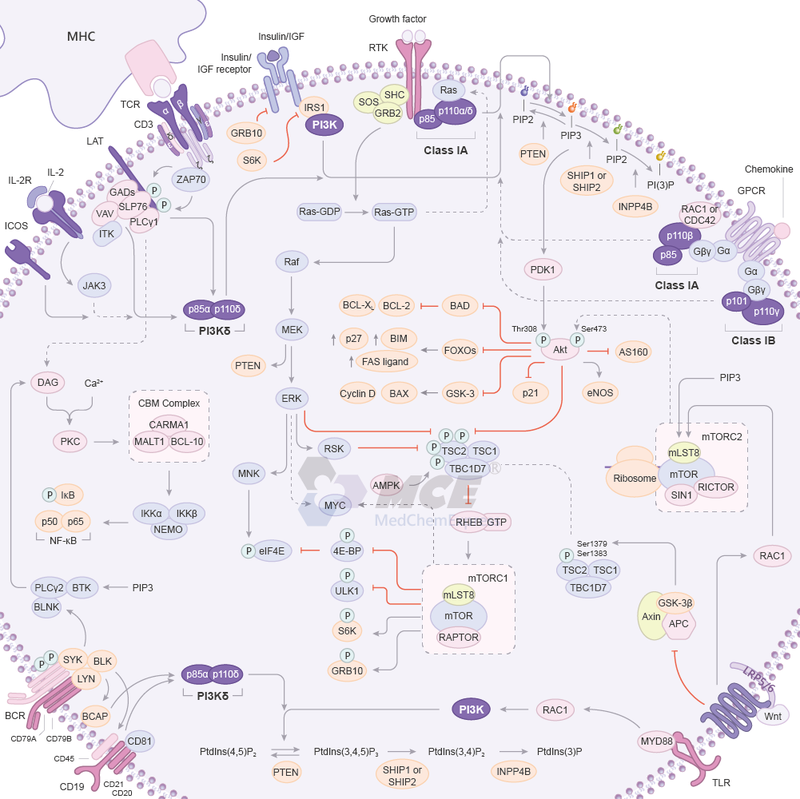 The PI3K/Akt/mTOR signaling pathways is crucial to many aspects of cell growth and survival, in physiological as well as in pathological conditions. PI3Ks constitute a lipid kinase family. Class I PI3Ks are heterodimers composed of a catalytic (CAT) subunit (i.e., p110) and an adaptor/regulatory subunit (i.e., p85), and can be further divided into two subclasses: subclass IA (PI3Kα, β, and δ), which is activated by receptors with protein tyrosine kinase activity, and subclass IB (PI3Kγ), which is activated by receptors coupled with G proteins. Akt kinases belong to the AGC kinase family, related to AMP/GMP kinases and protein kinase C. mTOR is a key protein evolutionarily conserved from yeast to man and is essential for life. The mTORC1 complex is made up of mTOR, Raptor, mLST8, and PRAS40, and the mTORC2 complex is composed of mTOR, Rictor, Sin1, and mLST8. Upon ligand binding, phosphorylated tyrosine residing in activated RTKs will bind to p85, then release the catalytic subunit p110. Activated p110 phosphorylated the PIP2 into the second messenger PIP3, and this reaction can be reversed by the PI3K antagonist PTEN. PIP3 will recruit the downstream Akt to inner membranes and phosphorylates Akt on its serine/threonine kinase sites (Thr308 and Ser473). Activated Akt is involved in the downstream mTORC1 mediated response to biogenesis of protein and ribosome. Many genes belonging to the PI3K/Akt pathway have been implicated in the pathophysiology of solid tumors and sensitivity/resistance to chemotherapy. More and more studies are now focusing on the translational relevance of targeting these pathways in cancer therapy. Porta C, et al. Front Oncol. 2014 Apr 14;4:64. Follo MY, et al. Adv Biol Regul. 2015 Jan;57:10-6. Li X, et al. Oncotarget. 2016 May 31;7(22):33440-50.